Heat Assault’s 500X unit is capable of reaching temperatures of 145°F or higher, resulting in total death of all bed bugs and bed bug eggs in a matter of hours. 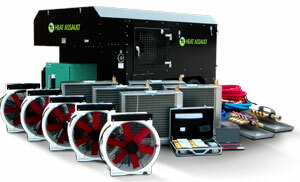 Heat Assault uses forced convection technology, which creates a powerful, consistent and uniform output of heat. This allows entire floors or multiple units to be treated at one time, with just one professional required and no additional state or province permit applications needed, the company says.